Killer Characters: What Could Go Wrong? I’m sure you’ve heard by now that Grey, my ex-fiancé, is back in my life. He has this crazy idea that my shop, Bow Wow Boutique, would make the “perfect” surveillance base for his current undercover FBI assignment. I think it’s a bad idea. He owns a well-respected art gallery in Laguna, which really does provide him with the perfect cover. Which begs the question, why can’t he continue to use his gallery as his cover? Typical Grey, he’s not spilling any details. Everyone in town knows we’re no longer a couple. How would we explain his presence at my shop? No one will believe we’re trying to work things out, and gossip spreads like a California wildfire. Grey thinks we can pull it off, but I’m not so sure. 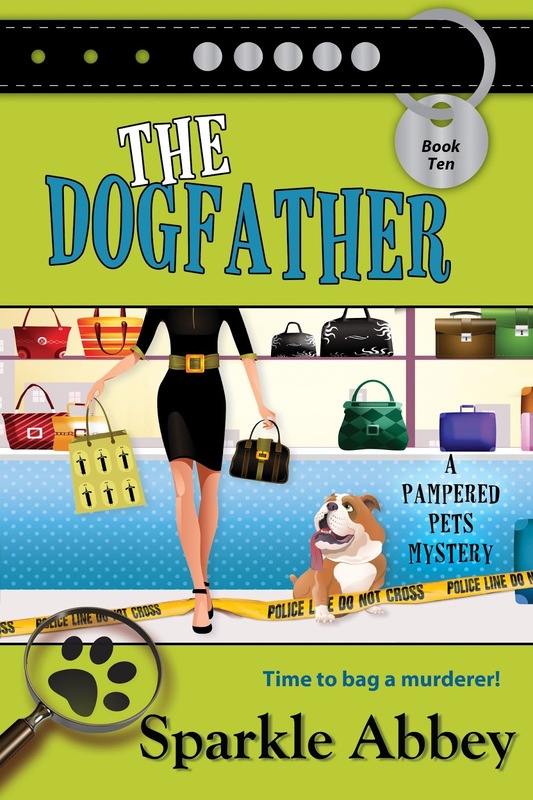 You can read all about my newest adventure in The Dogfather. To keep up with Sparkle Abbey, follow them on Facebook, Twitter, or sign up for the newsletter. Love the cover and can't wait for the opportunity to read the book! Love the cover. Looking forward to seeing how this turns out.